Oh, the Things You Can Find If You Don't Stay Behind! 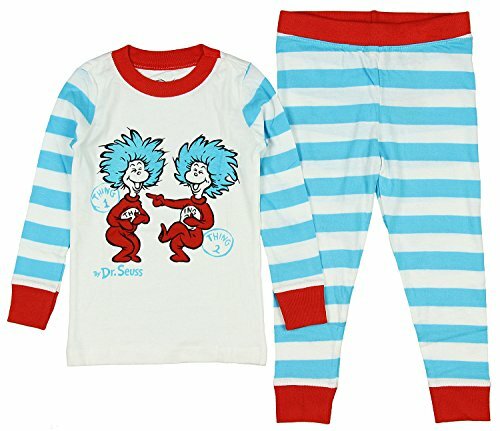 From the much-loved Dr. Seuss book The Cat in the Hat comes this striped cotton pajama set just for your child. Thing one and Thing two are coming for you. These gray and pink cotton pajamas come in a 2-pack set. 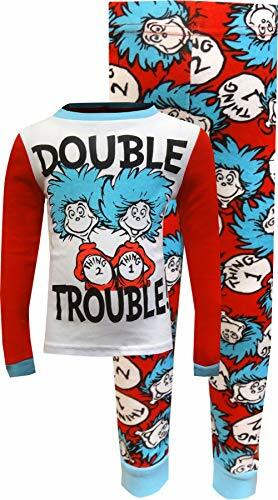 Both pairs of pajamas feature Thing 1 and Thing 2 from the Dr. Seuss book, The Cat In The Hat. Both pair of pajamas have full sleeved tops with pajama pants bottoms. The pajama top has a roomy neckline with cuffed sleeves. The pajama pants have an elastic waistline with cuffed leg bottoms. The 100% cotton knit fabric is machine washable and comfy to wear. These pajamas are designed to fit snug. Oh, the Things You Can Find If You Don't Stay Behind! 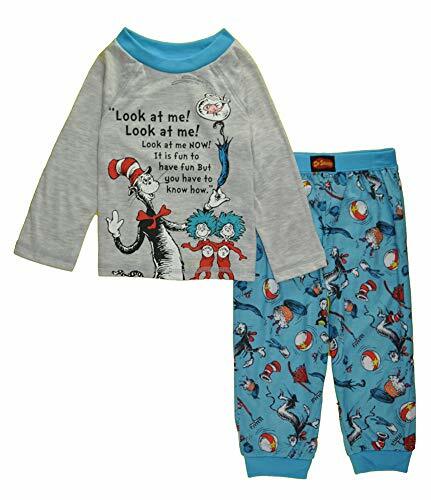 From the much-loved Dr. Seuss book The Cat in the Hat comes this striped 100% cotton pajama set just for your growing bookworm. 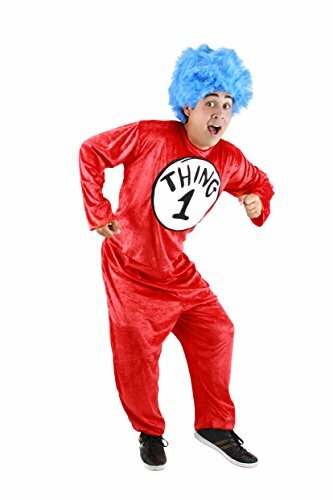 The set includes a long sleeve shirt featuring the mischievous Thing 1 and Thing 2 on the front. All-over red-white stripe print on the sleeves is repeated on the elastic waist bottoms. Neckline, ankle and arm cuffs are trimmed with stretchy soft ribbed fabric in contrasting soft blue color. 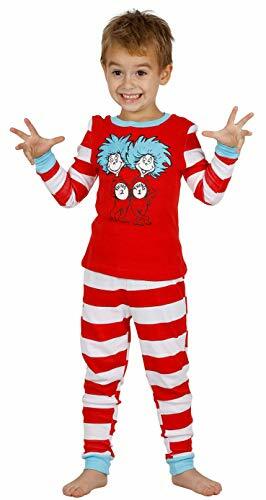 The cat in the hat is a classic children's story, so cozy up with your little dr. Seuss fan in this tight fit thing one and thing two striped pajama set. Made from 100 percent cotton, this pajama set is made to be snug fitting. 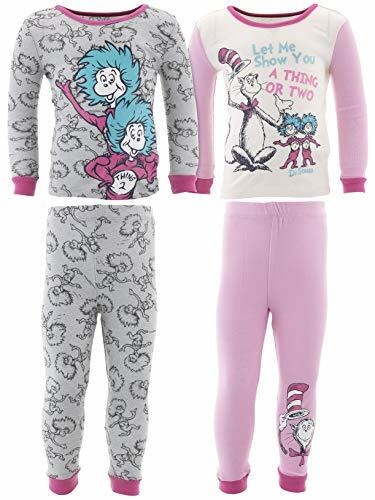 Perfect for the Dr. Seuss Fan, these cotton pajamas for girls feature everyone's favorite Dr. Seuss character, The Cat in the Hat. These pajama feature an elastic waist and ringer tee styling. Polka dot pants add a nice girly touch. Designed to be snug fitting to comply with safety regulations.